The title of Special Operations Commander was the highest known office attainable by a Sangheili in the Covenant Special Operations division. They held considerable political and military authority; a Special Operations Commander was placed in command of all the personnel and matériel of a fleet's Special Operations detachment and had the honor of speaking directly to the Hierarchs and relaying their messages to the High Council. It is unclear whether the position remains in service with any of the various Covenant remnants active as of 2558, with the possible exception of Arbiter Thel 'Vadam's Swords of Sanghelios. Rtas 'Vadumee, Special Operations Commander of the Fleet of Particular Justice, led his forces near Halo Installation 04 in September 2552, near Threshold in October, and at Installation 05 in early November. 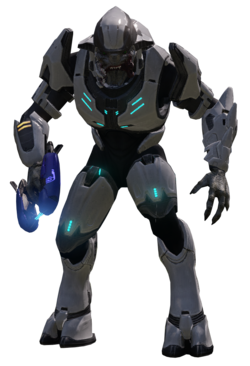 He later joined the Arbiter against the San'Shyuum and Jiralhanae (who had betrayed the entire Sangheili species) at the outbreak of the Great Schism. 'Vadumee (now 'Vadum) would come to humanity's aid during the Covenant's invasion of Earth, turning the tide of the campaign and contributing to the Covenant's destruction at the Ark in December 2552. ↑ In the Halo 2 developer commentary included with the Halo 3 Legendary Edition, Jason Jones refers to Rtas 'Vadumee as "Special Operations Commander of the Covenant", implying that 'Vadumee is the commander-in-chief of the entire Special Operations division. However, Halo: The Essential Visual Guide gives Vadumee's rank as "Special Operations Commander" and suggests that the title is not unique. The latter source is considered authoritative as it is newer and comes from 343 Industries.